Charles Biederman was born in Cleveland, Ohio to Czech parents in 1906. He worked in a commercial art studio in Cleveland from 1922-6 and then studied at the Art Institute of Chicago from 1926-9. He remained in Chicago until he moved to New York in 1934. 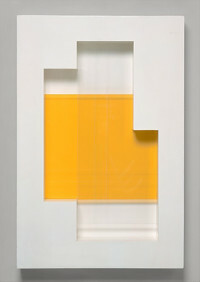 While in New York, he became influenced by late Cubism; however in contrast to the works of the Cubists, Biederman’s work eliminated subject matter. He briefly lived in Paris from 1936-7, where he met Piet Mondrian and Fernand Léger, among others. His first solo exhibition was held at Pierre Matisse Gallery, New York in 1936. 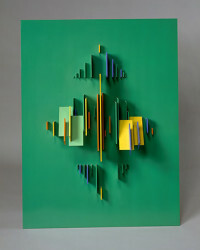 Biederman abandoned painting the following year and began to concentrate on painted reliefs. He returned to Chicago in 1940, where he would live for 2 years before moving to Red Wing, Minnesota, to work in isolation. By 1949-50, he had developed his signature style of work, a type of relief with small planes attached to each other or a background, painted in limited but bright colors. He published two books on his art and color theories. He lived in Red Wing until his death in 2004.